Our Resident Betty Sue Church grew up gardening. 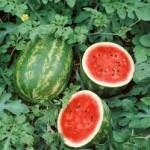 So it was no surprise when she recently embarked on a mission to grow watermelon in our garden. “My mom taught me how to garden.” said Betty Sue, “but I kept it up my whole life. I got married at 16 and I went to growing and canning everything I could.” It was her love for growing her own food that led Betty Sue to plant a few watermelon seeds in the front garden. Betty Sue took care of the vine on her own for about 3 months. She watered the plant daily, pruned back the excess blossoms and weeded. Her hard work was rewarded the recent harvesting of the vine’s 8 watermelons. Our residents and staff were invited to a “Watermelon Party” where Betty Sue had the honor of cutting open the first melon. Ralph Myers quietly dips his paintbrush onto a palette holding vibrant reds, greens, and blues. He steadily lifts his brush and applies a careful stroke to the canvas. 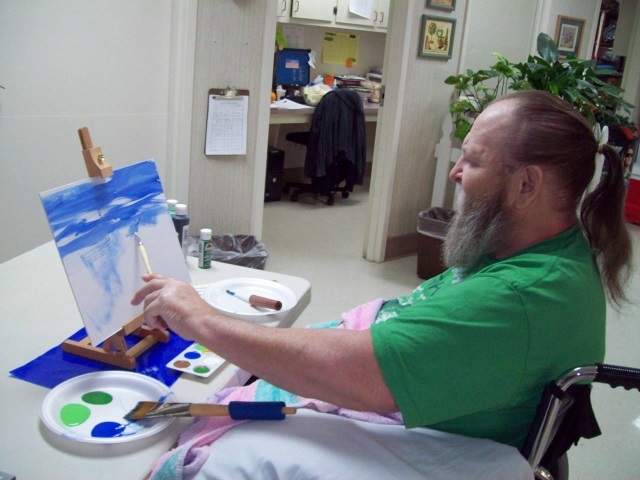 “Painting gives me a sense of well-being,” he says. To an observer, Ralph might seem like just an artist enjoying his work. 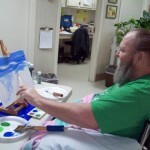 However, Ralph and those who know him understand his painting is the result of long months of physical therapy and that his ability to create fine works of art is something extra special. Four months ago, Ralph came to our facility. At that time, he was no longer able to hold a paintbrush, mix paint, or enjoy his artistic talent as he was used to doing. Ralph, a Mulberry community native, has been painting for 12 years. He taught himself using the well-known Bob Ross instruction videos. Finding himself unable to physically enjoy his craft had a deep impact on Ralph and he worked hard to change the situation. Ralph’s favorite medium is oil painting. He can often be found in the Activity Room creating a new work of art. 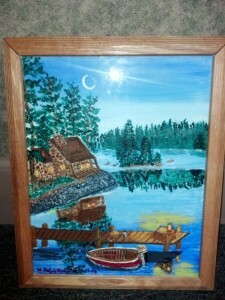 Old buildings, outdoor scenes, and animals are among his favorite subjects to paint. Shown is a photo of Ralph enjoying his craft. The completed painting hangs in his room. We congratulate Ralph on his hard work and dedication to regaining his quality of life and reclaiming his joy!